You have made my day with this chicken souklaki pita. It is delicious, is better than I even hoped, and is even beautifully presented in the wrap. I also appreciate that you deleted the onions and added olives on my request! what i ordered cost me $9 but they "accidentally" charged me $22. Been waiting over a month for this truck to come back to my side of town so I can get my money back. The gyro was pretty good. Nice amount of meat, BUT it is drier than a real gyro wheel would provide. I think they pre-cut and grill it onsite, which dries out the meat. The tsatsiki was tasty, not too garlicky which is good when heading back to work. It was missing tomato, which most places include, which made me knock off one star along with the dry meat. Delicious! I tried this on a dreary day perfect for a hot lunch, and it really hit the spot. The chicken was nicely seasoned and served piping hot with a good sauce. I was also nicely surprised by how good the rice was. I'll definitely be going back! It was delicious, but their menu on the website, vs what they actually serve, is totally different. I was hoping to get the platter, over a salad, with the pita and a veggi. Instead.. it came with rice (NO option to get it over salad) but then comes with a side salad, and potatoes.. but no pita... i want the one on their website menu!! 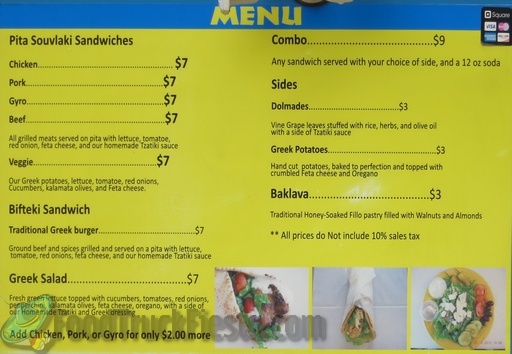 We serve any kind of meat like gyro chicken or beef over salad Greek or green for only $8 thank you for your review. 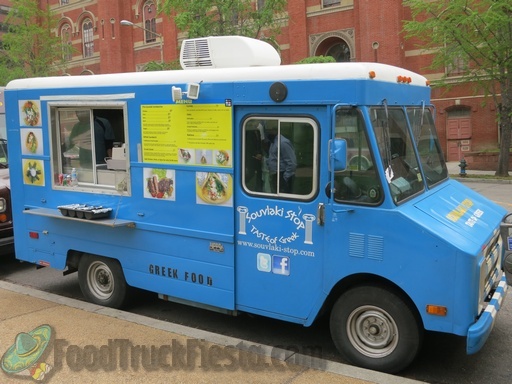 Souvlaki Stop serves traditional Greek food and will be launching in DC in May 2012. Menu items include sandwiches, platters, salates, mezedes and desserts.